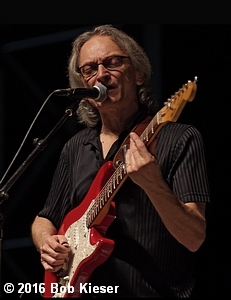 Sonny Landreth played his first gig when he was 14. “We played for my parents’ parties, and played all the Ventures’ songs. They paid us to stop, to be honest,” he laughs. Nobody would ever pay Landreth to stop playing these days, though. He’s a musicians’ musician, keenly exploring new musical paths, listening for new voices that he can speak with his slide guitar, and searching for stories that weave the universal blues themes of hope in the midst of despair. When Landreth wrote this song, he couldn’t have foreseen the rise of a political administration that sows division, but his prescient words illustrate Landreth’s compelling way with words and his canny ability to tell a story that resonates with everyone seeking some common ground in the midst of divisive times. Even when he was a child, Landreth wanted to play the guitar. “Back then parents could buy these plastic guitars with an image of Elvis on them; my mom and dad bought one for my brother and one of me, and we yowled at the relatives,” he laughs. His dad finally bought him a guitar, and he and his friends started playing together in a band: “one weekend his parents dealt with us, and then my parents dealt with us the next weekend,” he laughingly says of those early days. When he was 16, he began experimenting with the slide, “much to the horror of my family,” he chuckles. But guitar wasn’t Landreth’s first instrument. He started out on trumpet, and he fell in love with Miles Davis and John Coltrane. Landreth’s keen ear and restless desire to compose music grew out of the influences of his jazz and blues heroes. 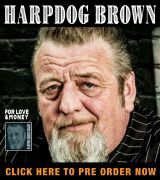 “When I was working in a record store, the fellow there turned me onto Chet Atkins, and then I got turned onto acoustic blues,” he recalls. When he started playing guitar, he applied the lessons that Atkins, the blues guitarists, and his favorite jazz musicians had taught him. These influences deeply imbue Landreth’s playing, singing, and writing. As a songwriter, Landreth also weaves these influences into his music and his lyrics. 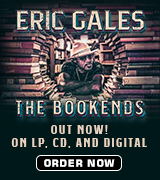 Like the acoustic bluesmen who’ve shaped him so deeply, he’s after authenticity—capturing the truth of an experience as close as possible—and universality—capturing the themes of an individual experience that transcend that experience and reach us all. For Landreth, the music has always come easy. Writing songs, he points out, relies on intuition, on being able to catch that just-right tune and lyric when it comes your way and being true to what rings most truly to you; those are marks of songs that have a universal character and stand the test of time; “I’ve always wanted to write a song that stood the test of time,” Landreth says. Landreth’s playing, singing, and writing have indeed stood the test of time, and other musicians have acknowledged his work by recording his songs or writing songs that they admit are influenced by Landreth’s songs. 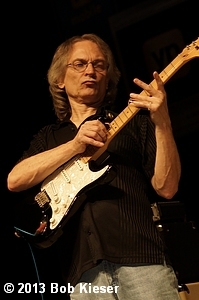 Landreth’s had the opportunity to play with the father of British blues, John Mayall. “Harry Shearer discovered my song, “The Center’, which I made in 1981, and played it on his radio show. John heard it and invited me to play on some of his sessions. It’s so funny that he and I were at the Santa Cruz Blues Festival, and he came up to me and said, ‘I always play your song ‘Congo Square,’ but I don’t want to play it tonight if you’re planning to play it,’” Landreth laughs. One of Landreth’s greatest influences was Clifton Chenier. As a teenager in Lafayette, Louisiana, Landreth went to see Chenier at a club, but Landreth wasn’t old enough to get into the place, so he stood at the door peering in and listening to the music. “He saw me at the door and invited me in.” Landreth eventually started playing in Chenier’s Red Hot Louisiana Band, and Landreth acquired new skills during that time, including the ability to change keys and musical styles quickly and smoothly. 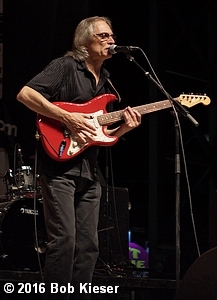 Landreth recorded Blues Attack in 1981 while he was still playing with Chenier, and in 1985 one of his best-known songs, “Congo Square,” appeared on his album Down in Louisiana. “Clifton had a profound influence on me and my music,” Landreth says, “and he was such a welcoming presence in my life.” That same year he met Chenier, Landreth also got to meet B.B. King. “Me and a buddy of mine went down to New Iberia to see B.B. King. King finished his set and went over to the bar and sat down. I was bold enough to go over and introduce myself to him, and the conversation we started that night sort of continued because I got to know B.B. over the years,” Landreth says. “The last time I got to play with him was at Madison Square Garden, and he didn’t seem to be feeling too good that night. Not long after that night we lost him.” In that same year, Landreth met B.B. he saw Jimi Hendrix in Baton Rouge, and though he didn’t get to know him as he did Chenier and King, Hendrix influenced the young Landreth in myriad ways that he carries with him even now. 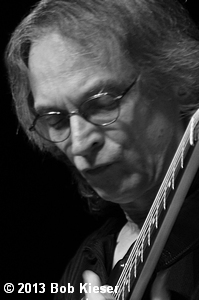 While these three influences stand out for Landreth, he also points to Jose Feliciano, Scotty Moore, Robert Johnson, Elmore James, Wes Montgomery, Andre Segovia, and Mike Bloomfield as deeply influential for him and his music. In addition to his own solo work, Landreth contributes his singular style of slide guitar to albums by Jimmy Buffett, John Hiatt, Eric Johnson, Gov’t Mule, Mark Knopfler, Little Feat, Josh Hyde, and Buckwheat Zydeco, among others. Landreth is excited about his new work these days. In January, he and his band, which expanded to include Steve Conn on keys and Sam Broussard on guitar, played three shows at “this beautiful theater here in Lafayette,” says Landreth. “We wanted to do both acoustic and electric sets to capture our true sound. It was so much fun. For the acoustic set, we added this cool resonator guitar that had an aluminum body with a vintage auto hubcap for the plate; the bass player played a ukulele bass, which gave us this new dimension of sound.” The plan, says Landreth, is to do a double album with one side of acoustic material and the other side of electric material. Landreth hopes to have the album ready in time for the New Orleans Jazz and Heritage Festival. When Landreth looks at the state of the blues today, he’s encouraged. He points out that the title track of Bound by the Blues addresses this issue. Does Landreth have any advice for young musicians starting out in the blues?